I have been so busy sewing tops and dresses all summer that I have neglected a major need in my closet - bottoms. I had to fix this; so, over the past few weeks, I have been sewing shorts. The first pattern I pulled out of my pattern library was the Allegro pattern from Love Notions. 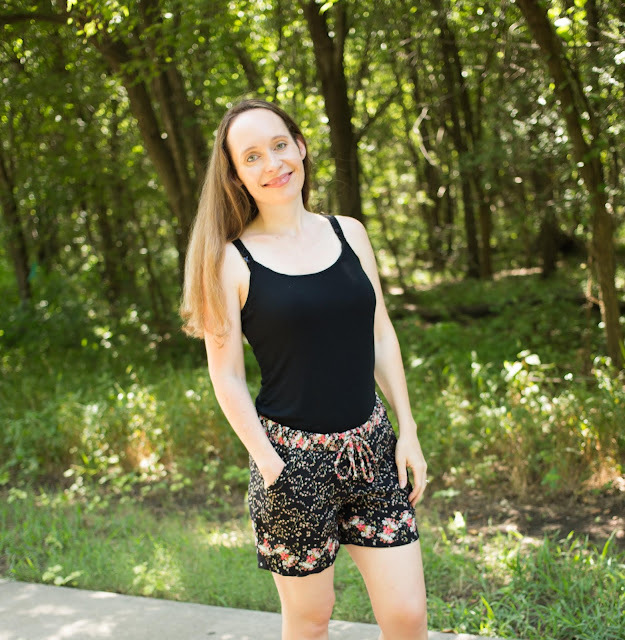 I purchased the Love Notions Allegro pattern when it released a year ago and was so excited to live in them all summer long last year. At the time, though, I was in my first trimester of pregnancy and still utterly exhausted. I powered through making my first pair while my kids were at VBS one morning and loved the way they looked finished. However, when I tried my shorts on, my stomach had already outgrown the shorts. I put them in the rapidly growing pile in my closet of clothes that did not fit. It seemed that everything that was not a stretchy knit was going into that same pile. I had my sweet baby in January and have had a few months to shrink back to normal. So, when the warm months set in, I tried them on, and they fit! Here I am (in this photo below) wearing them on Instagram during Me Made May this year with my Anna shirt that I blogged about here. They fit great and were absolute LOVE. 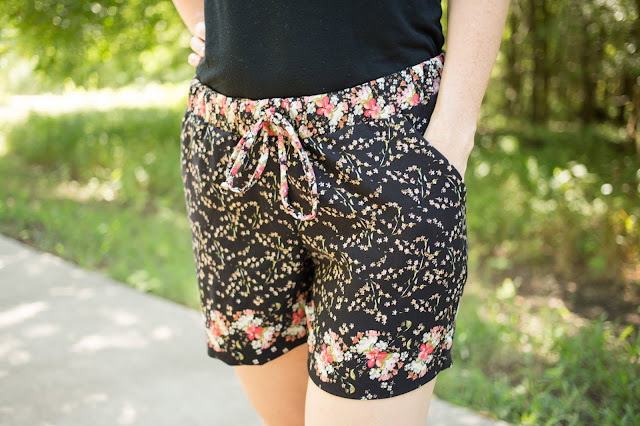 I made these first shorts out of an Amy Butler Sateen Fabric in the Lark Collection called Ivy Bloom. The cotton sateen is a medium weight twill fabric. Fast forward to July, and I knew I needed to make another pair of these shorts. I had some rayon challis from Sly Flox left over from the Havana dress that I made in June. The scrap was just enough to squeeze out another pair of Allegro shorts in. I love that this pattern not only works for medium weight fabrics (like the sateen I used for my first pair) but that it also works for those lighter weight woven fabrics that I have left over from making other clothes. Most of my patterns for woven bottoms really need a bottom weight fabric to look right. Rayon challis is a lighter weight apparel fabric that I normally think of for tops and dresses. It works wonderful for this pattern, though. It flows just right and gives these shorts such a comfortable feel. The size range on this pattern is XS to 3XL. I made the XS. My waist is 26.5 and hips are 36 inches. The waistband on the Allegro pattern requires 1.5 inch elastic and has a drawstring to keep them cinched. That forgiving elastic waist is much quicker to make than a traditional full zipper and fly. The elastic waist is forgiving enough for a buffet but not forgiving enough for maternity. This is the pattern I will pull when I want to use a woven fabric and am pressed for time. I also really like that this is not only a shorts pattern, it includes cropped pants and two skirt views. The shorts come in a 5" and 9" inseam. I made the 5" inseam for both of my pairs. The Allegro pattern can be found here. The rayon challis can be found here. Thank you so much for reading my blog! You may follow me on Instagram or receive updates by liking my page on Facebook. If you want to take a look into the things that inspire me, you can follow me on Pinterest. You may also follow my blog with Bloglovin. Disclosures: This post may contain affiliate links, which means I receive a small compensation when you purchase via my link. 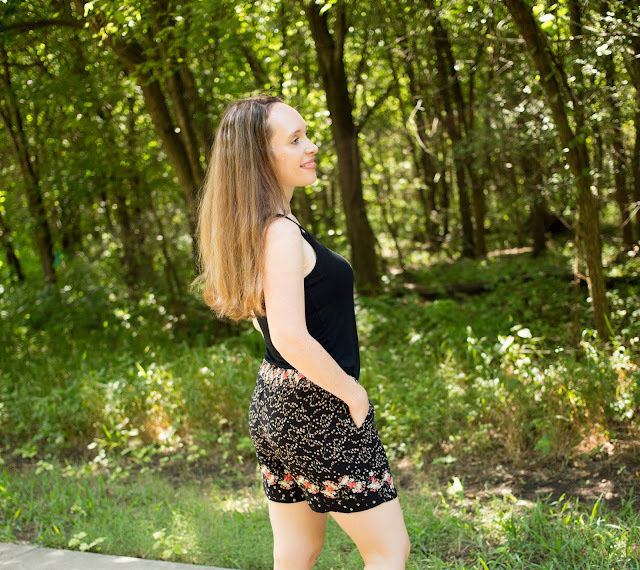 There is no cost to you, and it allows me to continue to tell you all about my latest favorite sewing finds.